Before The 'D'...Association Football around the world, 1863-1937. Fall River is a city in Bristol County, Massachusetts, associated with the textile industry. In 1880 the population was 48,961. The American Soccer History Archives list no fewer than 30 Association football teams being formed in Fall River during the period 1882-87. Many of these appear to be 'works' teams. Between 1888 and 1892 teams from Fall River won the American Cup five times in succession. Rovers played 2 matches against the Pilgrims (England) tourists- drawing 1-1 and winning 2-1. 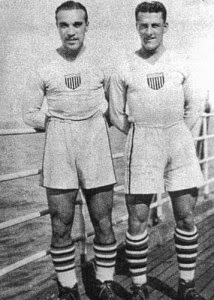 Rovers’ Tommy Swords captained the USA in their first ever international. 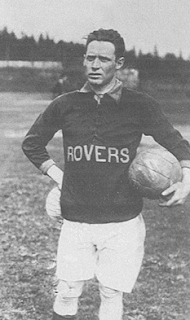 Sam Mark took over the ownership of Fall River United in 1922 and named them the Marksmen. He was also behind the construction of the Mark's Stadium, one of the first 'Soccer specific' stadiums in the USA. This venue was in North Tiverton, Rhode Island, as Massachusetts law prohibited the playing of commercial sports on Sundays. The Marksmen featured former Chelsea player Harold Brittan; Scottish born goalkeeper Lindy Kerr; James White, Tommy Martin ( both ex Motherwell), Bill McPherson (Beith) and Charlie McGill (Third Lanark). Marksmen beat the touring Sparta Prague 3-2. Marksmen played 2 touring sides. They defeated Brazil’s Palestra Italia 4-2 but lost 3-0 to Glasgow Rangers. Fall River Powers Hudson Essex shared the National Amateur Cup following a drawn final. Fall River Marksmen - Atlantic Coast League Winners, American Soccer League Winners, National Challenge Cup Winners. The Marksmen played 2 Scottish touring teams in 1930: Kilmarnock were beaten 3-0 whilst Glasgow Rangers enjoyed 3-2 and 6-1 wins. In 1931 The Marksmen relocated to New York City, merged with New York Football Club and became New York Yankees (although they still played Cup matches as Fall River Marksmen). The Yankees in turn moved to New Bedford where they merged with Fall River F.C (#1) to become the New Bedford Whalers. New Fall River based clubs emerged in the 1930s. In 1932 Fall River Football Club (#2) won the 'fall' edition of the American Soccer League. In the following seasons the New England Division of the American Soccer League featured Fall River Rovers and Fall River United. The Fall River All-Americans reached the National Amateur Challenge Cup Final in 1935. The 1930s also saw the development of another Fall River club that would go on to great success (but outside our chosen era)- the amateur Ponta Delgada Soccer Club, based in the city's Portuguese community. This blog was originally named Gottfried Fuchs Du Bist Ein Fussballgott. Gottfried Fuchs (1889 –1972) was a German footballer. 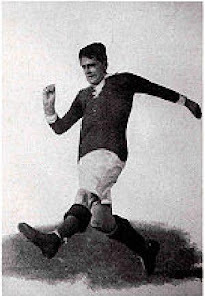 He scored 10 goals for Germany in a 16–0 win against Russia at the 1912 Olympics.